Download the DVD trailer to your iPod! 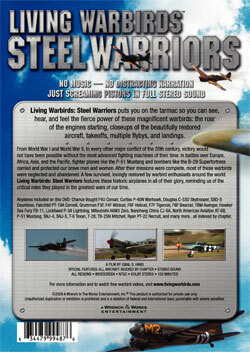 Living Warbirds: Steel Warriors puts you on the tarmac so you can see, hear, and feel the fierce power of these magnificent warbirds: the roar of the engines starting, closeups of the beautifully restored aircraft, takeoffs, multiple flybys, and landings. From World War I and World War II, to every other major conflict of the 20th century, victory would not have been possible without the most advanced fighting machines of their time. In battles over Europe, African, Asia, and the Pacific, fighter planes like the P-51 Mustang and bombers like the B-29 Superfortress carried and protected our brave men and women. After their missions were complete, most of these warbirds were neglected and abandoned. A few survived, lovingly restored by warbird enthusists around the world. 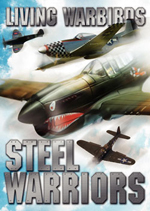 Living Warbirds: Steel Warriors features these historic airplanes in all of their glory, reminding us of the critical roles they played in the greatest wars of our time. Airplanes included on this DVD: Chance Vought F4U Corsair, Curtiss P-40N Warhawk, Douglas C-53D Skytrooper, SBD-5 Dauntless, Fairchild PT-19A Cornell, Grumman F3F, F4F Wildcat, F6F Hellcat, F7F Tigercat, F8F Bearcat, TBM Avenger, Hawker Sea Fury FB-11, Lockheed P-38 Lightning, Mitsubishi A6M Zero, Nanchang China CJ-6A, North American Aviation AT-6B, P-51 Mustang, SNJ-4, SNJ-5, T-6 Texan, T-28, TB25N Mitchell, Ryan PT-22 Recruit, and many more...all indexed by chapter. SPECIAL FEATURES: All Aircraft Indexed by chapter, Dolby Stereo Sound, Widescreen. "If you love warbirds, you'll LOVE this DVD! 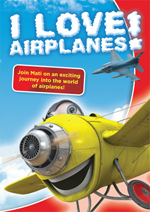 From the closeups of the classic warbirds, to the idling engines as they taxi by, to the screaming engines as they fly past, this DVD is excellent. 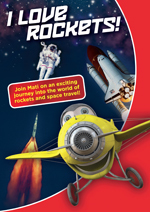 There is no music or narration, just the sweet sounds of the roaring engines! And the closeups of the aircraft are beautiful. 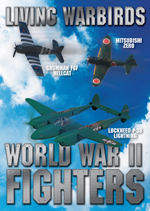 There are over 50 warbirds featured on this great DVD, including popular ones such as the P-51 Mustang and SNJ, and rare ones such as the Mitsubishi A6M3 Zero.